We (Josh, Hiba, and Justin) are back in Calgary continuing work on the Watershed+ residency project. Our studio for the week is the Crew Shack, a converted trailer. 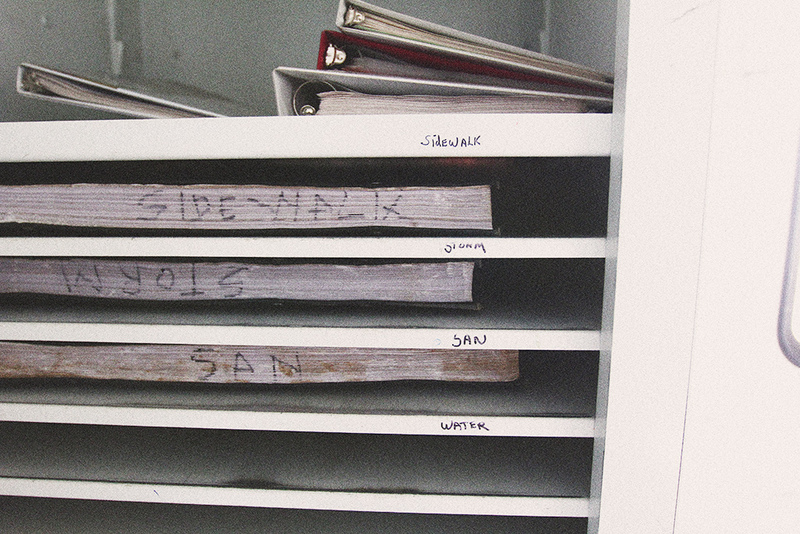 There are remnants of past crews in the cabinet. We’ve been working together and apart at a range of different speeds since the summer and this residency will offer a chance to think about what that means going forward. We’ve spent time tossing around ideas that seem to involve the people working in and around the Water Centre, supporting the infrastructure, rather than the infrastructure itself. In some ways, it feels like a departure, and yet maybe this is an honest response to being invited into an infrastructure, more or less for the first time. What is the standard operating procedure from the inside? On the final day of our ATTC Calgary residency, the billboards launched. We headed out in the early afternoon with Randy to document them all. Alongside highways, on the sides of buildings in the downtown core, and mixed in with other urban-fringe architecture. The billboards stood deeply embedded and clearly removed from the landscape, at times being rotated amongst advertisements, and in other instances, acting more directly as annotations to the site of installation. 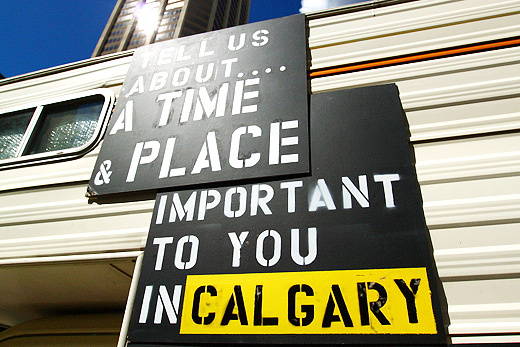 As a final trajectory of ATTC Calgary, these billboards were installed around the city noting a series of cyclical narratives. 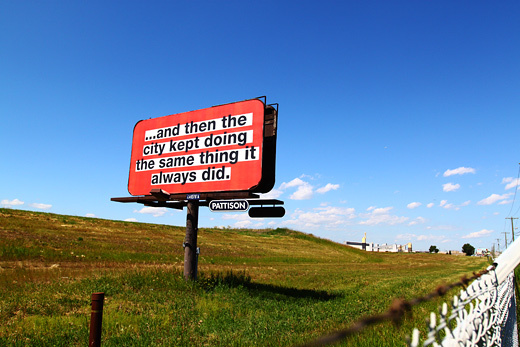 Using the phrasing, “…and then the city…” each billboard features a different statement that referenced an overarching narrative or perhaps a brief moment in time about the city, read either internally or externally. These billboards are aimed at creating a space for a momentary discussion around the possibilities in narratives themselves, which is centred on one’s personal connection, history, and knowledge on the city. In total, TRUCK had secured us seven billboard locations spread throughout Calgary, concentrated in the downtown core and in the city’s industrial edge. What we wished to explore was the notion that Calgarians are on average a kinder population. We also were curious if there were any trends in the areas that these kind acts occur. Josh, Todd, Randy, and I handled on the day’s activities, while Justin took a break after a marathon work session on our upcoming publication (which we’ll be posting soon). Before and after a visit from CBC Radio’s Karen Moxley, we cleaned off and re-used our blackboards from Day 4 with a new goal in mind: to find distinct examples of friendliness at street level. 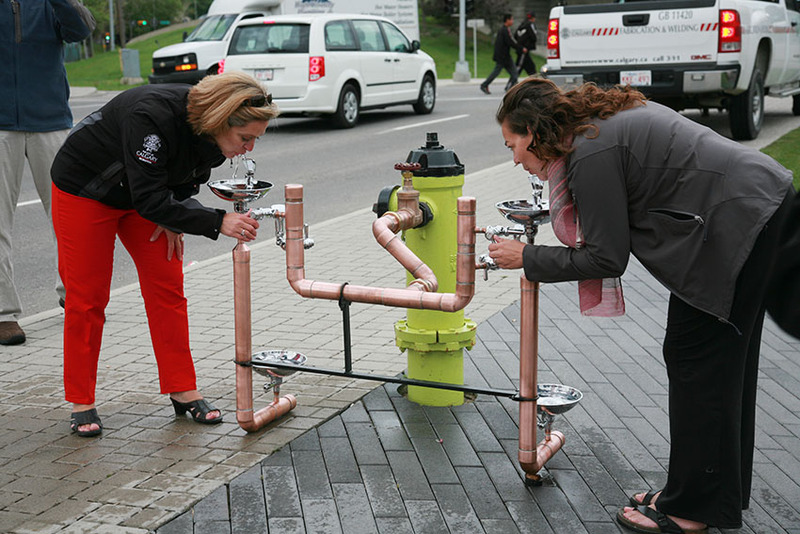 Although the park had far fewer pedestrians than Stephen Avenue, we were still able to get useful feedback from Calgarians, while at the same time allowing them to take a break from their busy day to recall previous acts of kindness. Our work on ATTC Calgary with Truck Gallery’s CAMPER Urban Discovery project continued with a couple day’s break from events, allowing to focus on planning the remainder of our residency activities and starting work on our publication. Tuesday night was our projection event around the edge of Central Memorial Park — an impeccably well-manicured green space in the middle of a downtown neighbourhood, and a welcomed surprise. A few logistical concerns aside (like having to connect seven extension cords to reach the edge of the park), we had a pretty ideal spot. A blank light-cemete wall always makes for a good projection screen. The projections themselves were a series of text-based statements articulating of a set of narratives around Calgary that were originally based on the responses to our fill-in-the-blank statements and eventually moving on to real-time feedback and participation from those community members in attendance. 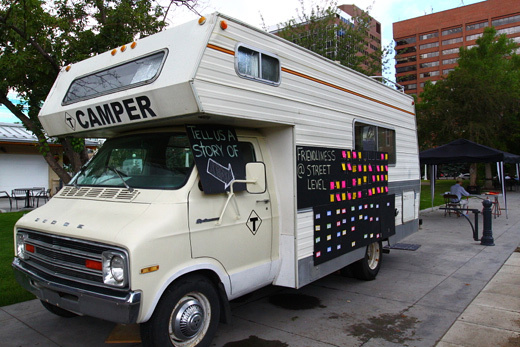 On Day 3 of our ATTC Calgary with Truck Gallery’s CAMPER Urban Discovery project, it rained, and so we planned. We planned and discussed and reviewed some of the answers we had received from our activities on Day 2 — glimpses of the state of Calgary, from a ground-level perspective. 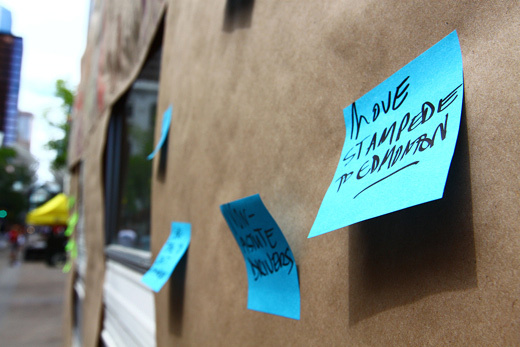 For Day 4, we had to condense our planned events into an single afternoon, collecting answers to a series of fill-in-the-blank statements and eventually creating a CAMPER-wide chalkboard to collect a timeline of Calgary. Working to understand Calgary through these gestures provides insights to a city in between many things — a military fort and a sprawling urban centre, a longtime home and a temporary situation,the site of the first roadhouse and the place that Tim Hortons amalgamated with a small coffee shop, a celebrated Olympic site and the place of someone’s first concert. All of these experiences, memories, and invented histories create a space for dialogue around the narratives that create the social shape of the city and not only how we interact with it, but how we interact with one another. 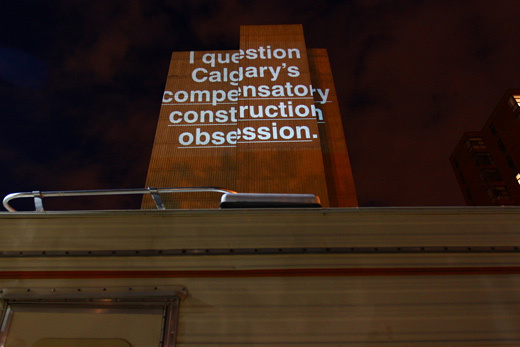 On Day 2 of our ATTC Calgary with Truck Gallery’s CAMPER Urban Discovery project, our ongoing work finds us asking questions about a city that we’re still just getting to know. 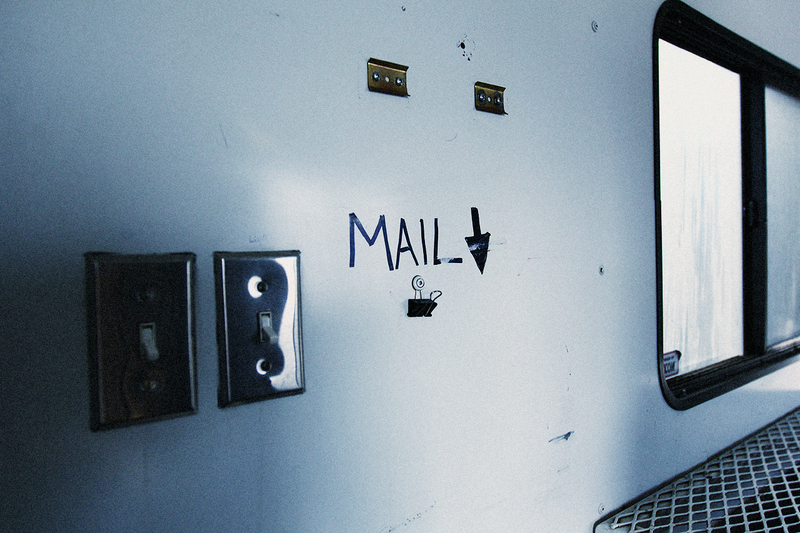 The questions are, necessarily, basic and straight forward. We’re not conducting deep sociological or statistical research, but rather trying to tease out a series of narratives that we know we haven’t yet heard about this place. Over the course of the residency, we’re aiming to develop a practice, a series of tactics that aim to unfold a way to get to know a place and the things that go about shaping the things we can know about a place. Cities are continually enacted through the narratives that we hear, create, and tear apart through daily practice, and we’re interested in both the narratives and that daily practice. Over the course of a few hours on Thursday afternoon, we hear about many parts of the city that are worth loving, and worth changing. Somehow, an impression is made upon us that aligns with what we felt during our algorithmic walk — that is, Calgary is a city that isn’t readily touchable. It feels distant even when it’s right in front of you, and somehow the things we heard about the city from lifelong residents and people on holiday were the things that are legible from a distance, but in some instances, distanced from lived experience.